There has been yet another delay in the judicial review case of the five police officers who have been trying to influence the court to support their argument that a murder charge should not be read to them. The officers were arrested and charged for the murder of Joshua Etienne, who having been held for possession of ammunition on August 4th 2014, was found dead a few hours later in a police cell at the Portsmouth police station. But before the charge was read, on August 12th 2014, officers Haden Morgan, Gemma Lewis, Martin Seaman, Delvin Challenger and Olan Vigille, and their lawyers claimed that aspects of the Coroner's Act had been violated; magistrate Bernard Pacquette agreed that the matter should be passed on to a judge to decide on an application for judicial review. On August 26, 2014 Judge Errol Thomas granted that application for judicial review. It is expected that after reviewing the laws, the judge will decide whether to grant, or reject, an order to prohibit a magistrate from "hearing, adjudicating or otherwise exercising any magisterial functions with respect to the claimants" in that case. He will also decide whether or not the arrests of the police officers were "illegal or oppressive" and may, or may not, grant a stay of execution of the proceedings in the case. Originally, Justice Thomas set the trial date for September 24, 2014. However, when the matter came up, Lennox Lawrence who is leading the legal team for four of the five police officers told the court that the State had filed and served on his Chambers additional affidavits outside of the time stipulated by the Court and if they had to deal with it then the entire process would be "further delayed". He told the Court that he was disturbed and taken by surprise at that and it appeared that they (the State) were attacking "the form." But in his rebuttal Attorney General, Levi Peter, who is leading the defense on behalf of the State, disagreed, saying that "much of what the applicants had filed in their affidavits was "hearsay, irrelevant and scandalous". Judge Thomas then set September 26th for the Applicants to file and September 29th for the respondents to reply. Both parties were also to file and exchange written submissions by September 29th.The hearing was set for September 30th at 10am. The Applicants and Respondents appeared before the court as directed on September 30, 2014 and the matter was heard in the afternoon. Lawrence told the court then that his team had filed an "Amended Fixed Claim Form" on September 26 and also served it on the State lawyers. He told the court that in effect what was filed before is "a nullity" and that the State had to properly follow the rules. 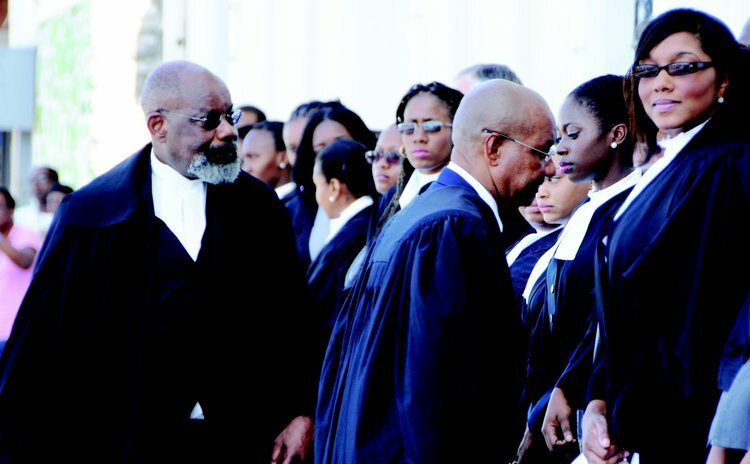 However, Tamika Hyacinth from the Attorney General's Chambers told the court that she was willing to abandoned certain aspects of what they had filed and was prepared to argue on the narrow ground whether they did not apply for and obtain leave. But Lawrence in his rebuttal said: "The Rules don't permit such, you cannot amend something which has fallen away…the original application is dead. They know the rules and must follow it." Justice Thomas then told both parties that they need to concern themselves with "the legality and illegality" and that they should get there as soon as possible. He also expressed concerns about comments being made about the matter in the press. "Members of the media, if you don't understand what is going on in the court ask a lawyer, this is about justice," he said. After much discussion, the matter has been set for trial on October 16, 2014 and both sides are to file affidavits of submissions and arguments with authorities by October 13, 2014. Judge Thomas urged both parties to "burn the midnight oil" in order to get the matter going.